Radiators only lukewarm or have cold patches? Does it take forever for your hot water to heat up? 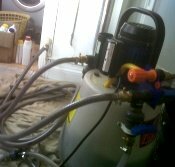 Power flushing can restore your heating system! Before you think about replacing, try our professional power flushing service. Sludge and debris builds up in your heating system over time, blocking and restricting the hot water your boiler produces. By connecting a high-flow flushing pump to circulate cleaning chemicals around your system, this debris can be removed. In short, your heating bills will come down as your boiler won't need to work so hard. To make an appointment or if you would like more information, please call Alex on 07812 647 026 or email centralheating.maintenance@yahoo.co.uk.